It came to me as I was supposed to be emptying my mind, and being in the moment, in yoga class. We were doing a funky asana, which required us to put the ball of one foot and the back of our skulls at either end of a looped strap, and surrender our cores to the weight. It actually felt really good, and of course, my mind started to wander as I hung there, because I didn’t have to concentrate. I immediately began thinking about food, specifically, the last thing I ate before coming to class. I was eating a piece of my first attempt at aerated chocolate. I was also eating an orange – you know, doing that “one bite of something good for me – one bite of something decadent” – thereby enabling to eat more of the decadent stuff. Anyway, the combination tasted wonderful: the creamy smoothness of the Callebaut milk chocolate and the tart orange juice. We are now moving out of the comfortable hanging pose, and I have to concentrate again, but I store the thought away – perhaps this would work as a signature piece chocolate? I stop at the grocery store on my way back from yoga for the only supply I am unsure I have – fruit pectin – and, smiling my beatific Namaste smile at the helpful manager who helped me find it, I am off to experiment. 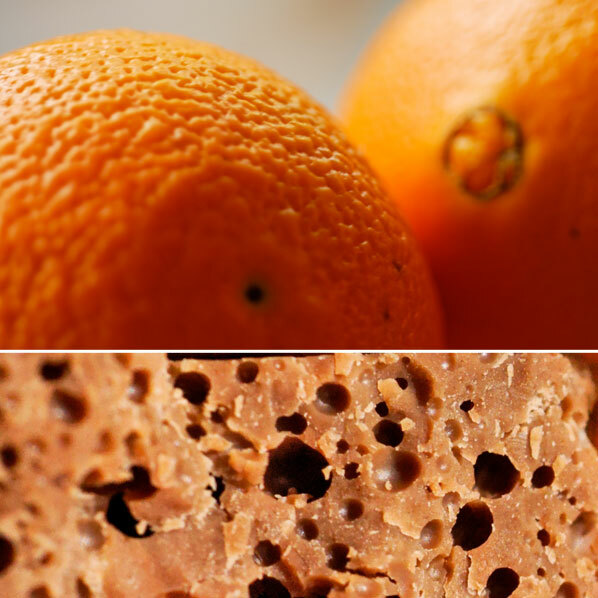 I have decided on two combinations of texture and taste in the “bubbles and squish” theme – one is a layer of aerated milk chocolate, supporting a layer of fresh orange pates du fruits. The other, is a layer of fresh lemon marshmallow atop a layer of aerated dark chocolate. I have, in my crisper, some organic oranges which juice well, but are not great for eating out of hand. Likewise, some organic lemons which need to be used up, before they become wrinkly. I have a box of milk and a box of dark aerated chocolate. The frugal confectionery goddess is calling. I love cooking in the evening, when everything feels a little more relaxed. My fabulous sous-chef (younger son) agrees to help with the orange pates du fruits, recipe courtesy of Zoe Francois. My son is a pro at this, experienced and capable from the last time we made them. He is also an instinctual cook – he sniffs everything before it gets added in – and decides that liquid fruit pectin smells “gross”. After my own whiff, I have to concur. This leaves me with two hands free to work on the marshmallows, recipe courtesy of Emeril Lagasse. Nothing to do now, but to leave our pans of jellies and marshmallows to ripen overnight, at room temperature. But I do cover them, in case of curious felines. First thing, next morning – another of my favourite times of day to cook – I wrestle the marshmallows from the pan – hmm. They have not set up to be quite as fluffy as I had hoped. I got a bit worried about my poor old Kitchen-Aid mixer, having to beat the mixture for a full 15 minutes, so I stopped it at 12. They are quite gooey, but they taste good, and their texture is quite forgiving as I am cutting quite small pieces, to place atop the chocolate. The chocolate itself has set in varying thicknesses (I really had very little control over the spray of the whipped cream siphon during the aeration process! 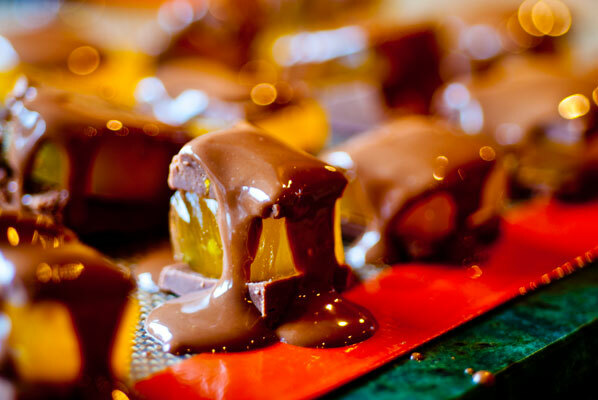 ), so I sandwich the thin layers, and stack mallow atop the thicker pieces of dark chocolate. The jelly has set with its usual beautiful, easy to slice consistency, and I can pretty much carve it to exactly the shape I need to fit the milk chocolate. The orange taste is very delicate, as I strained the mixture, this time – next time I will leave the bits of zest and pulp in, for added flavour. They are now precariously stacked up, and I know it will be a disaster as soon as I try to dip them. I decide therefore, that I will drizzle a coating of chocolate over the tops of the assembled stacks. It will not look very professional, I know, or even very neat and tidy, but I am afraid of losing my bubbles! Strangely enough, the chocolate I have melted (from the shavings and irregular hunks of the aerated stuff) retains some of its bubbliness, as I pour it over the stacks. The resulting sweet amuse bouches look like mini sundaes, and some of them have set at peculiar geometric angles, which I could not have done intentionally, but actually look quite smart. The milk chocolate/orange pates du fruits squares are satisfyingly squishy in texture. They could definitely use a little more zest, which I will add next time, and perhaps cut back on the sugar. Lovely, melt in the mouth texture, and it slides like velvet down my throat. The dark chocolate/lemon marshmallow needs a ratio of more mallow and less chocolate, as the aerated dark chocolate is very intense. Not much is needed, at least, not as much as I have in these pieces, or perhaps another flavour/texture accompanying the lemon? Perhaps an apricot puree. The current texture is reminiscent of a rich, dark marshmallow Easter egg! This is a rare occasion where the milk chocolate definitely trumps the dark, in my opinion. And as for my skill? I will repeat the mantra I have come to embrace: I still have a lot to learn, in creating and crafting chocolate. So I will continue tasting and testing, balancing and blending. And that brings a Namaste smile to my face.